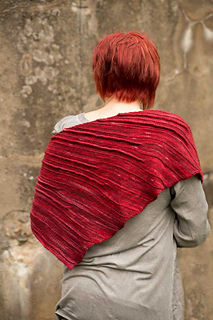 “Pleat Up!” is a triangular shawl knit from side to side on the bias in one piece. It’s simple, classic and clean look is broken up by textural elements while shape-changing worked-in pleats account for the slight curvature at the nape side, making this shawl wrap nicely around the shoulders. Especially cozy when knit from a very soft yarn such as the one used for the pictured sample shawl! “Pleat up!” was designed in collaboration with Malabrigo Yarn as a part of Malabrigo Quickies. Malabrigo Rastita (100% Merino) 100g/ 310 yards (283 meters), 2 skeins or approx. 500 yards [457 meters] of any DK weight yarn that knits up to gauge. Gauge is not essential; however, with a different gauge, actual finished measurements and total yardage will change. Want to make it larger? Check out this project. Questions? Join Hanna’s group -- Hada’s Little Corner.